Zack and I had our first non-family visitor two weeks ago, Ellen. Having Ellen visit was amazing. We really needed a visit from an old friend and now I am trying to convince her to move here. Since one of Ellen and my favorite things to do when we are together is bake, the weekend of her visit we whipped up two pies. This delicious Key Lime Pie because Publix brainwashed me into needing one and a Lemon Meringue since it seemed appropriate. 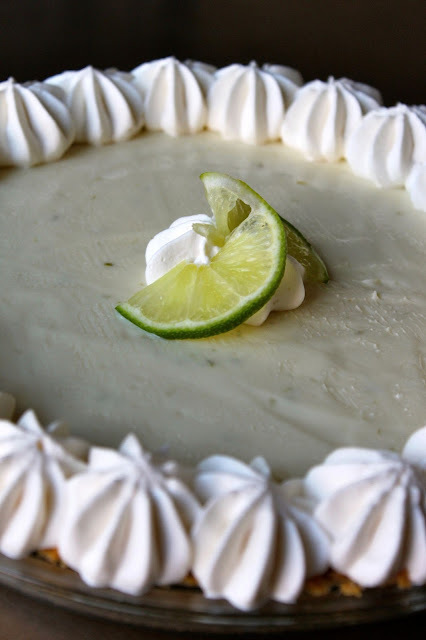 If you live in the South like I do, then you may have recently been inundated with commercials for Publix's Key Lime Pie. I have not tried their pie, but I hear it is pretty tasty. They really want me to buy there pie because it seems every time I get in my car I hear it on the radio and every time I turn on the TV I see there commercial. I suppose in a way the commercial worked, because I did buy all the ingredients to make this pie at Publix, they got me in the store. Anyway, this pie is really fantastic and incredibly easy to make. I highly recommend it. I fancied our pie up a bit with some piped homemade whip cream and a homemade crust, but feel free to use a pre-made crust and some whipped cream in a can. Preheat oven to 350 degrees Fahrenheit. In a medium bowl, combine the condensed milk, lime juice, and lime rind. Mix well and pour into the graham cracker crust. 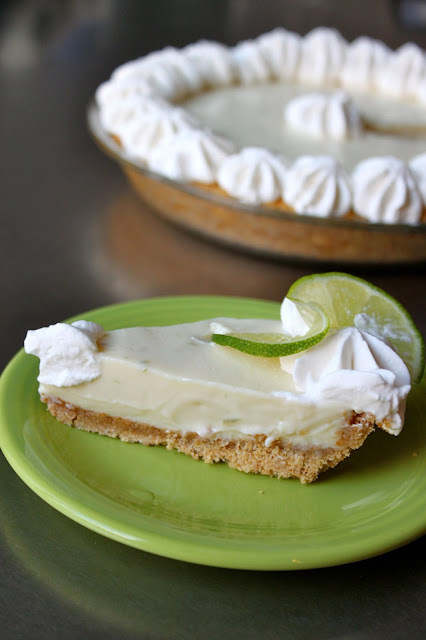 Baked in preheated oven 8-10 minutes until tiny bubbles burst on the surface of the pie. DO NOT BROWN. Chill pie thoroughly before serving. Garnish with whipped cream if desired. p.s. Zack and I loved having you here Ellen. We would love more visitors!